37-770 – 1/2-in. wide – 37-750 – 1-in. 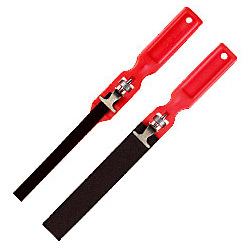 wide Sanding sticks (10″ overall length) with molded plastic handles come in two widths 1/2″ and 1″. Both are packed with an 11″ long, 120 grit cloth back sandpaper strip. 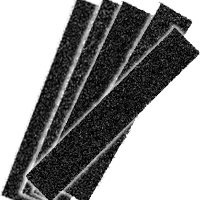 Replacement strips are available in packs of 10 per grit or assortment packs with 2 of each grit. 3M Micron Graded Wet/Dry Polishing Papers cut into strips from 8-1/2″ x 11″ sheets work well (for fine polishing on smooth surfaces). Emery paper cut from 11″ sheets or 1″ or 2″ wide rolls can also be used with the sticks. Read or download SDS/MSDS sheet on the abrasives used to make these products. 1-in. wide Cloth Back Sanding Stick Paper. Choose from 5 different grit 10-packs or assortment pack. Strips fit 1-in. wide Sanding Stick 37-750. 80grit (37-766), 120grit (37-767), 180grit (37-768), and 220grit (37-769), are recommended for wood. 400 grit (37-765) is recommended for ultra fine wood sanding and for sanding metal and plastics. Assortment 37-762 contains 2-each of 80, 120, 180, 220, and 400 grits. 1/2-in. 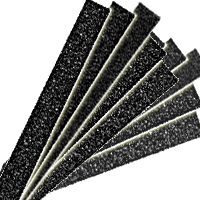 wide Cloth Back Sanding Stick Paper. Strips fit 1/2-in. wide Sanding Stick 37-770. Choose from 5 different grits or an assortment pack. 10-packs 80 grit (37-786), 120 grit (37-787), 180 grit (37-788), and 220 grit (37-789), are recommended for wood. 400 grit (37-785)is recommended for ultra fine wood sanding and for sanding metal and plastics. Assortment (37-782) contains 2 of each 80, 120, 180, 220, and 400 grits.